Terry blew into our office from Chicago and nothing has been the same since! 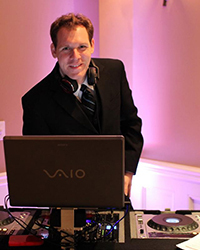 This newlywed DJ has been called “the complete package” an excellent emcee and mixologist who isn’t afraid to get out from behind the DJ booth to keep the party going. At first appearance, he’ll put you at ease with his polite midwest manner… but don’t let this Clark Kent fool you, he’ll drop that disguise behind the turntables. With close to ten years as a mobile DJ entertainer, this high energy crowd pleaser knows how to keep your dance floor packed with guests and FUN! Terry has range from weddings to mitzvahs, birthday parties, corporate events, and even bars/clubs. This guy has been everywhere and done everything-he can’t wait to get the party started at your event. Why He’s VIP: Besides his Bachelor of Arts in Film, he’s got game- as a major league gamer AND is fluent in Japanese. Ready for some Holiday Cheer? Fall in love with our award winning LA DJ’s that play the music YOU want to hear! Experienced & eloquent professionals who know that a party should be FUN! Orchestrate your mingle & dinner hour from elegant to upbeat with our live musicians!